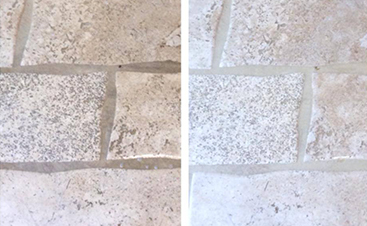 We offer ALL Stone Restoration services, from General Cleaning to Repairs & Total Refinishing using Diamond Abrasives. 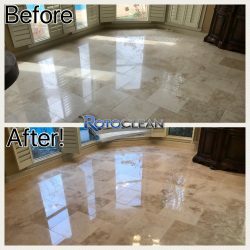 Our natural stone experts have been trained & certified by the master who literally wrote the book for the Marble Institute of America and use many of the same techniques used by the Italian stone masters of old. 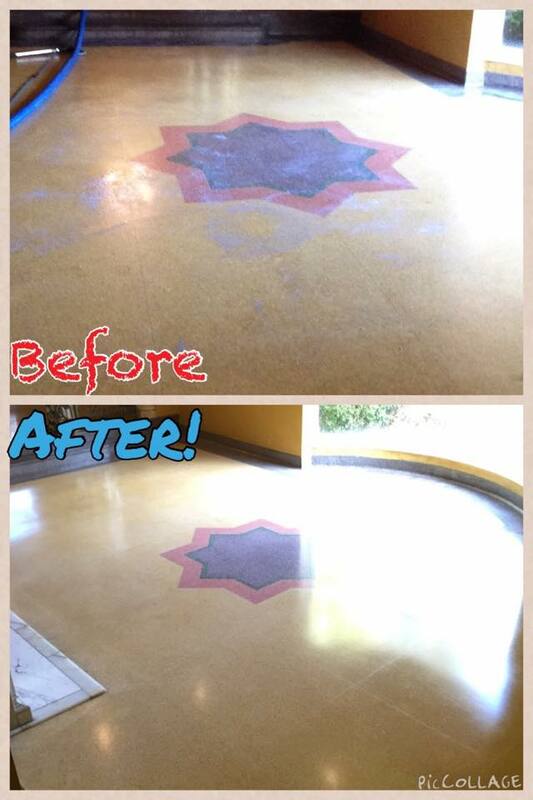 Refinishing is the restoration of the existing finish or if desired, increasing or decreasing the level of shine. 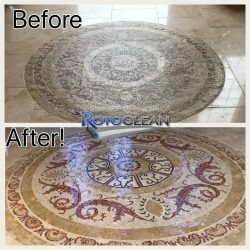 During the stone floor refinishing process, we perform deep cleaning techniques while the surface is wet and follow up with sanding the stone floor to remove etches and scratches. The newly exposed surface is then restored to the specified shine using a fine diamond abrasive and polishing powders. The penetrating sealer is applied to soak deep into the pores of the stone to provide well-rounded protection. 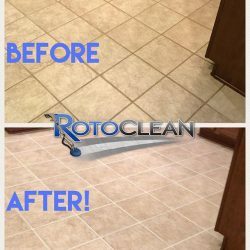 Our technicians then turn their detailed eye toward the grout and other smaller components of the entire floor that they can then fix. 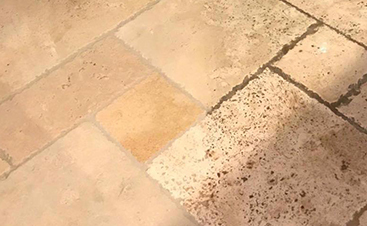 The matte or “honed finish” is the most common finish for textured materials and porous surfaces such as limestone, tumbled travertine and marble flooring or countertops. 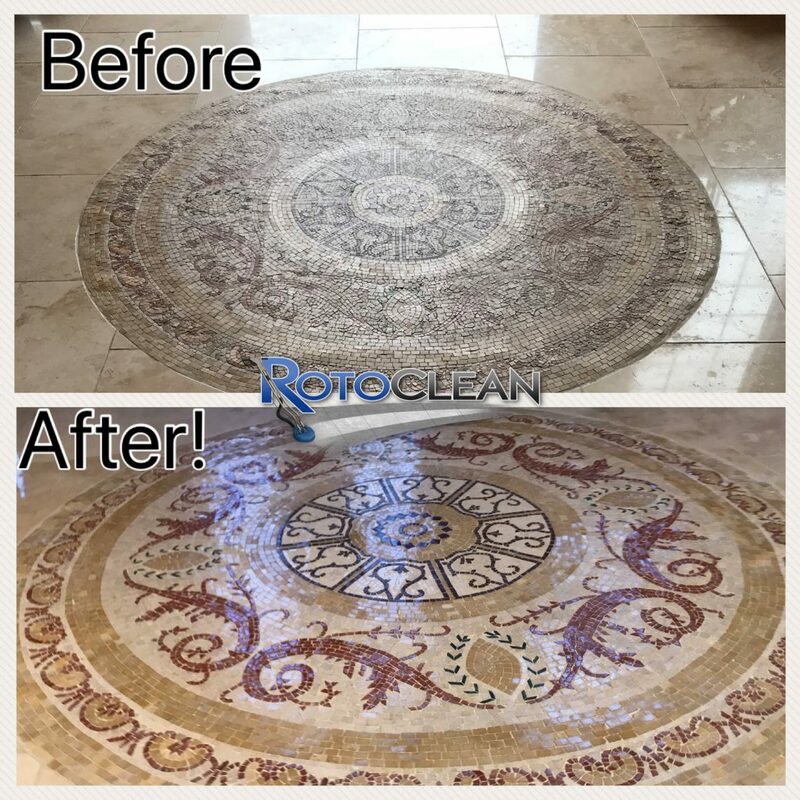 It provides a softer gleam that won’t easily expose the etches and other damage that may occur over time. 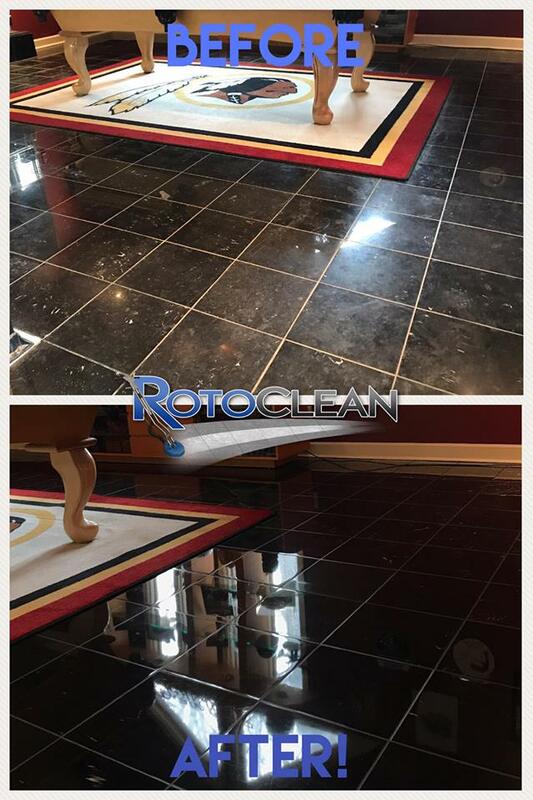 Satin is the most common finish for stone floor refinishing because of its polished appearance. It gleams at an angle, but hides scratches and mild etches that occur with everyday use. A polished surface is known for providing the highest sheen, characterized as having a “clear reflection” with depth. This attribute is noticeable when looking into the stone from an 80-90 degree angle. When considering a polished finish it is important to know the limits of your material. Most surfaces can achieve a high mirror-like reflection, but some materials have soft spots and natural areas of haziness. 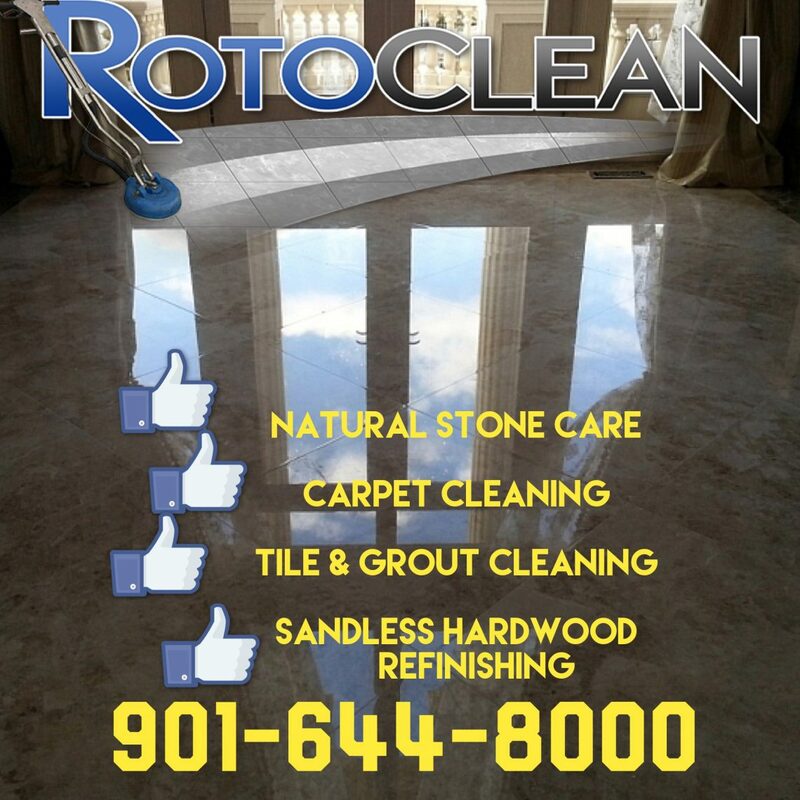 If you are unsure if your marble, travertine, or limestone surfaces can achieve a high even finish, give us a call. We would be happy to advise you. Intend to keep your marble vanities as stunning as the day they were installed? The constant barrage of use from family and guests can slowly degrade the shine and clarity of the surfaces. 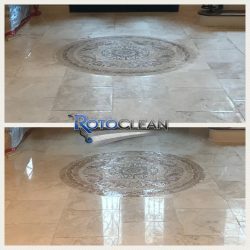 Because Marble, travertine, and limestone surfaces scratch and etch easily it’s a good idea to have a prepared technician on staff for when your marble falls short of greatness. 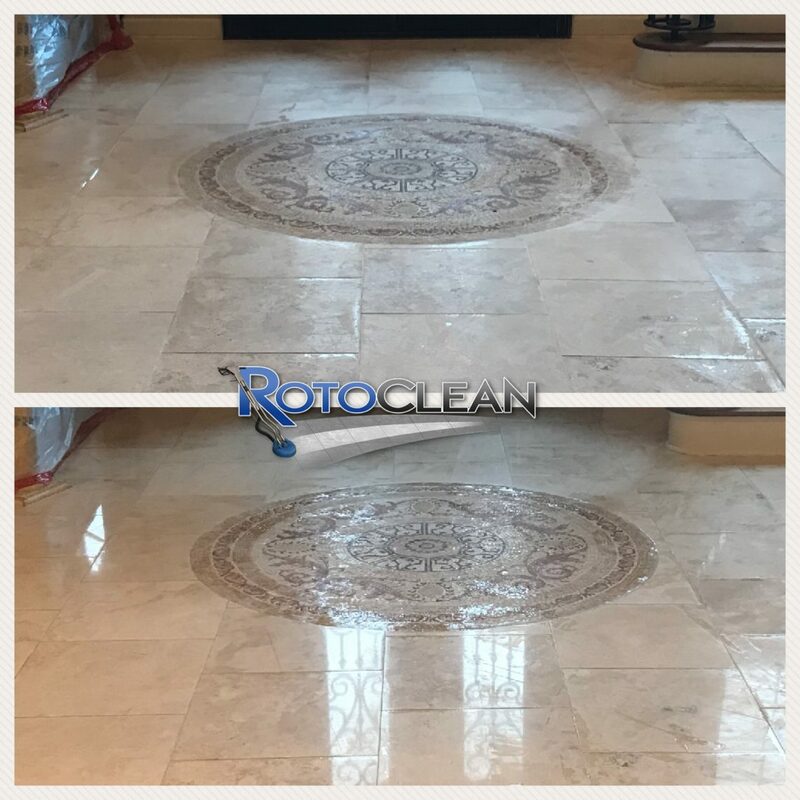 Our professional technicians are always available to restore your marble back to their original, beautiful condition and seal them for added protection. 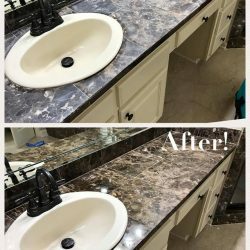 To keep your marble looking fresh for longer, wipe your countertops daily with a clean damp towel or microfiber and neutral cleaner. 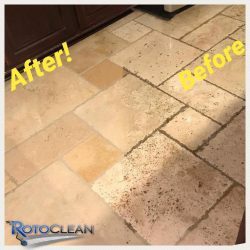 Currently, we offer our own proprietary cleaner that is safe for all stone, tile, grout, hardwood, laminate, most paints, stainless steel, glass, upholstery, carpet, vinyl, linoleum, and virtually any surface (with the exception of wool and silk) that will make cleaning and maintaining your refinished natural stone countertops a breeze. It’s important to note that kitchen surfaces should be professionally cleaned periodically to remove dirt and oil that regular cleaning can not remove. 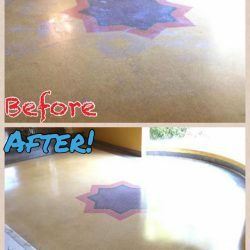 As far as long term maintenance, high-traffic surfaces should be sealed periodically to prevent long-term staining. 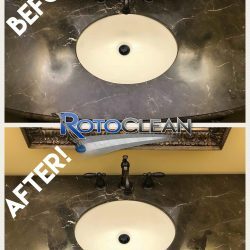 Over time, a heavily used granite counter space can become dulled by the constant abrasion of porcelain dishes, metal hardware, cleaning products, and other implements. 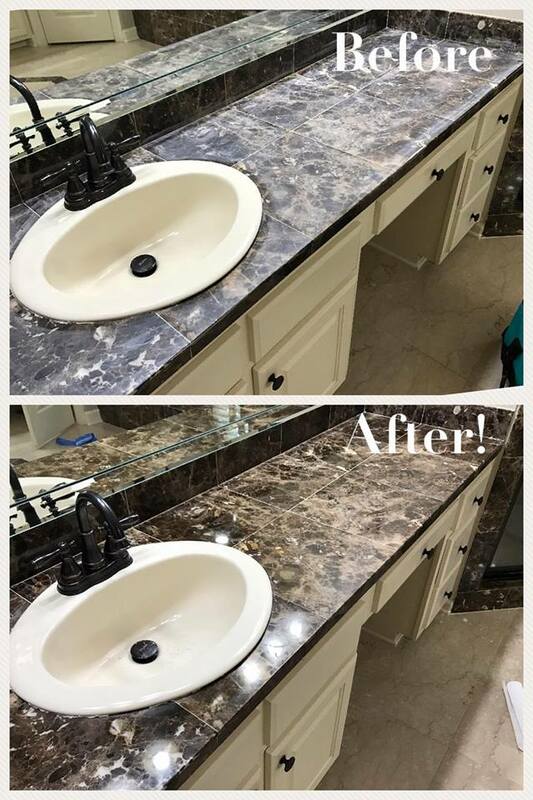 After significant wear, it’s good practice to invest in polishing or countertop refinishing to bring out the natural beauty of your stone. 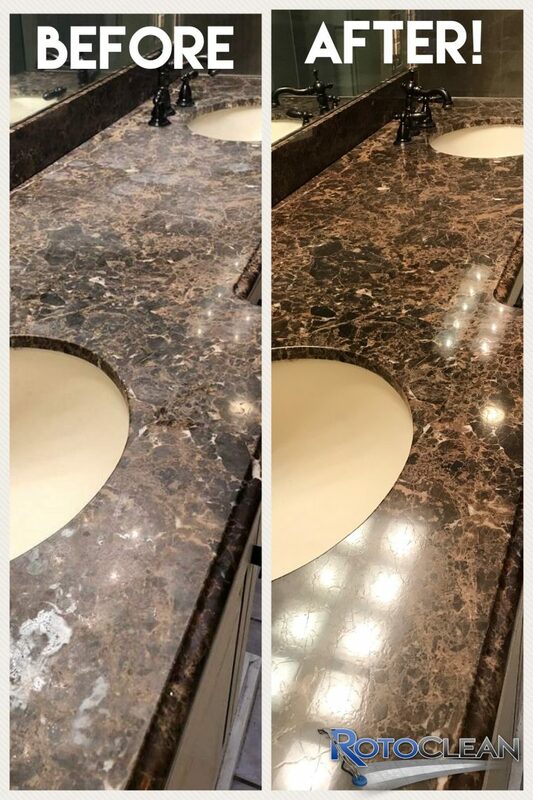 Once the surface is brought back to a polish it is detailed and sealed, and you can rest easy, for your newly polished granite will last for years. 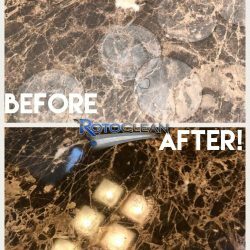 Cracks in your granite countertops often occur around the sink due to the common practice of placing a steel rod within the granite. Generally, the steel rod is positioned around the sink and will begin to corrode and expand. Water intrusion causes the steel to expand as it rusts and thus, these cracks are formed. They often run parallel to the sink and can manifest along the front and rear sink rails. 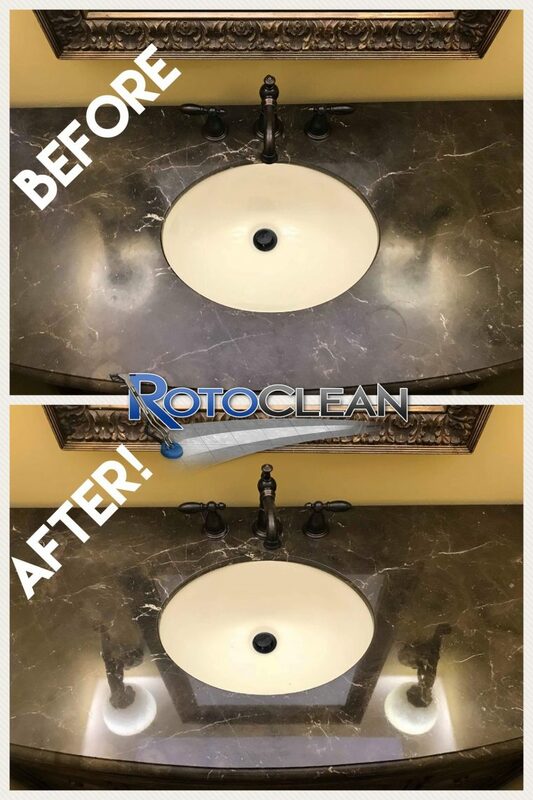 In many cases, these cracks cannot be permanently repaired, but Roto Clean can repair it to extend the life of your counters. From a seemingly insignificant texture change to large chips and holes, we can fill it all with state of the art UV cured adhesive. The repair is a permanent, impact resistant surface that can be color matched to almost any stone and polished when the time comes. Upon evaluation, we can provide easy answers to all of your granite-related questions. 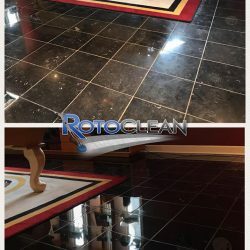 Because each granite slab is different and every application is different, the rule of thumb for sealing frequency is generally once per year. However, many dark granite counters will require less attention than light colors. If you have concerns regarding your granite, feel free to contact us to set up a personalized appointment. 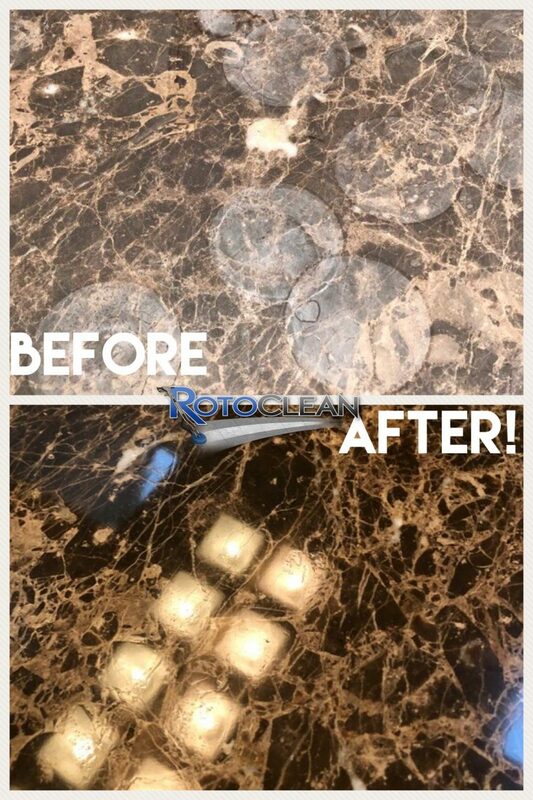 Always Remember to use a cleaner that says “Safe for Natural Stone Surfaces” when cleaning your counters. 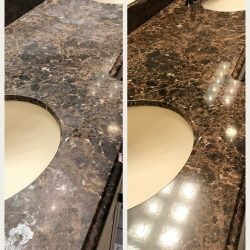 The use of our own proprietary product: “Worthy Stone and Multi-Surface Cleaner” will help to provide long-lasting protection for your granite countertops. Satillos provide a beautiful, old-world aesthetic to any space. They are easy to clean and easy to maintain by applying waxes and polishes for many years. However, this means that the debris from all of these polishes can slowly become more noticeable as time passes. 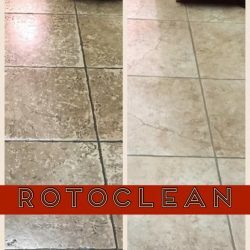 If you notice the grout lines becoming black and discolored, or that the tiles seem to have darkened you might pursue tile restoration. 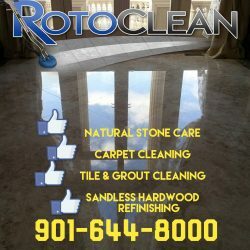 Roto Clean has been helping homeowners restore their saltilos all over Memphis and nearby areas. 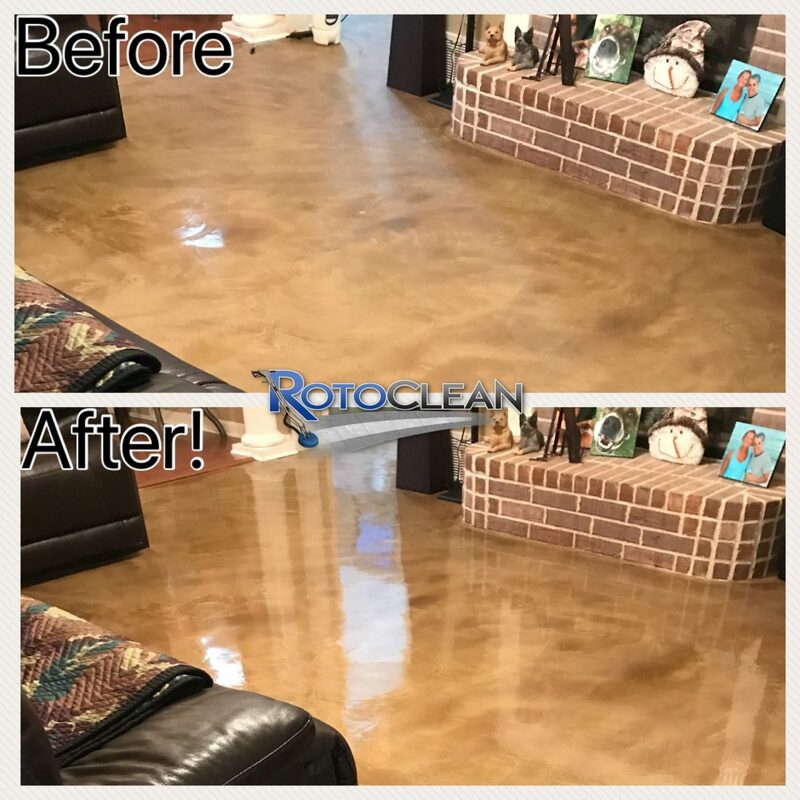 Tile is a beautiful alternative to other flooring materials, such as carpet and stone, because it does not stain and is easy keep clean with incredible longevity. 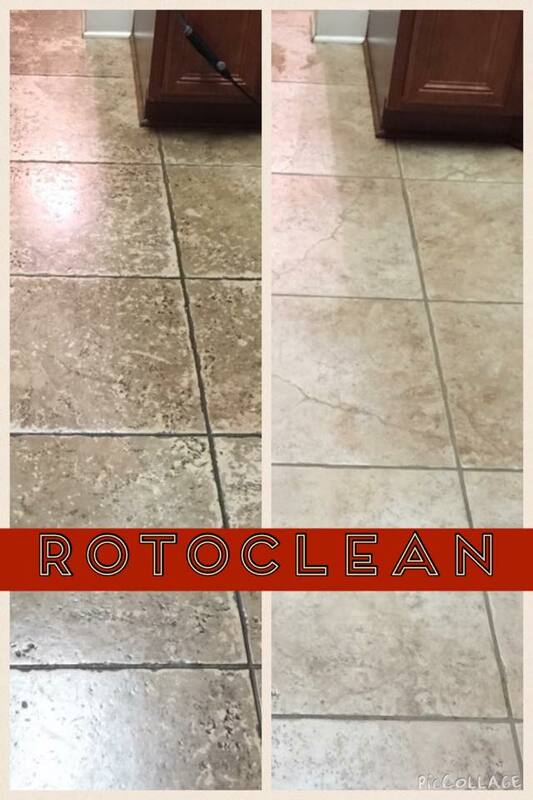 Over time, however, the grout lines between the tiles can become discolored from mopping and use. 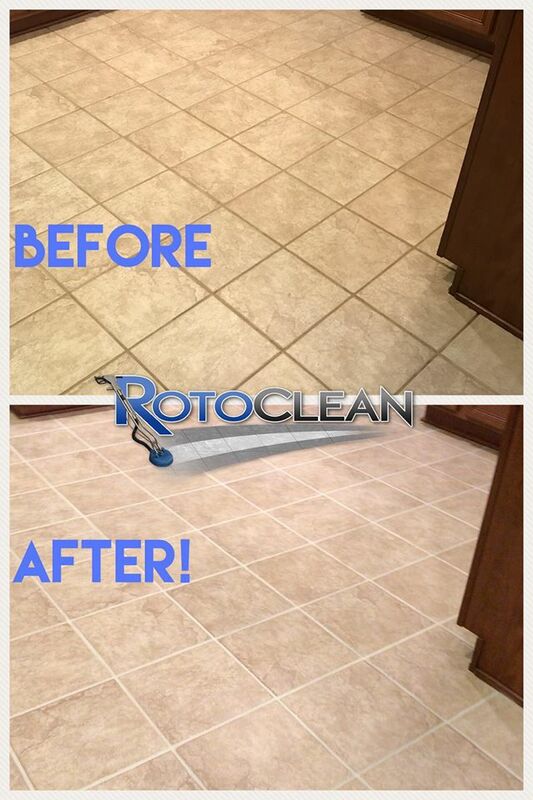 This is a common problem and Roto Clean was one of the first companies in the Memphis area to offer tile & grout cleaning and has become locally famous for reversing this process. 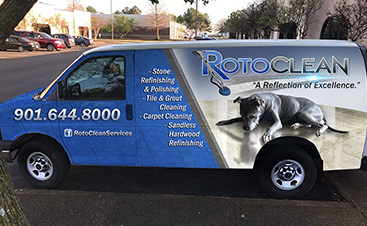 We use innovative truck-mounted, high-pressure hot water extraction machinery to deep clean your tile and grout. The machinery sanitizes as it cleans with ultra hot water along with environmentally friendly degreasers. These compounds loosen the dirt so it can be extracted from the surface.